Live looper Simply B rediscovers band life with SuperBubble. Musicians' practice spaces can be messy. So when you walk into one—especially one inhabited by a guy who goes by "B"—you're not prepared for a harmonious collision of obsessive-compulsiveness and feng shui. The hardwood floors are clean, and the furniture, instruments, cases and peripherals are precisely arranged. Someone's proverbial stuff is together. It'd have to be, for a guy like B—which stands for Brandon, Barker and Bob. ("My middle name is Robert," the bespectacled ginger says.) He's a Captain's Platter guy with an insatiable appetite for everything from funk to hip-hop to rock to singer-songwriters to soul to jazz. And one diversely influenced, versatile man can't sound like a band without organizational skills. Playing just one instrument takes focus. B prefers the beefy low tones that, in tandem with drums, anchor music's engine. His weapon of choice, natch, is the bass, but he wields a variety of axes: guitar, harmonica, drums and a banana-shaped shaker all at the same time. OK, not exactly. 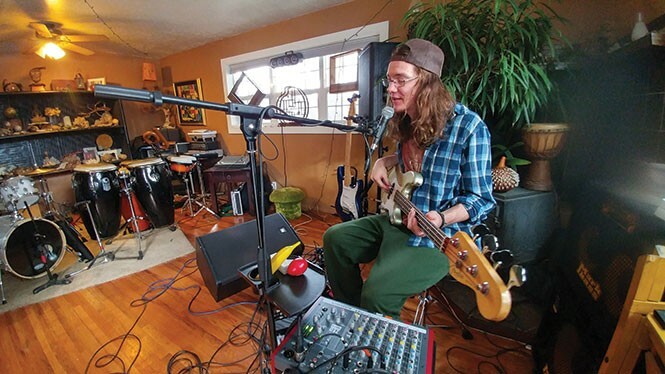 B uses a looping station at his feet to record a part on one instrument, set it to repeat, then put down the instrument, pick up another and play along to the track he just recorded while recording yet another track, then grab another instrument—and so on. He's doing it in his living room, playing and singing like it's a show, feeling the funk, tapping pedals, tweaking knobs on his mixer, shooting wordless queries as to whether I'm getting good photos. The song ends, and I ask him to dink around for a sec so I can try to nail a shot. "I can't fake it," he says, jumping into another grooving, percolating tune. We live in the future, ramping up to when Stephen King's Maximum Overdrive comes true and humans get destroyed by the Internet of Things—so looping isn't arcane witchery. We've watched Keller Williams (one of B's big influences) and Reggie Watts do it for more than a decade. Now even cheesy pop dudes like Ed Sheeran are into it. The technology isn't as impressive as keeping so many balls in the air while making music that's more than ambience. B caught the live looping bug years ago at a Williams gig. "We were all waiting for the show to start," he says, finishing lunch in his kitchen. Everyone was standing around, when they sensed something different about the pre-show stopgap music coming over the PA. "It was Keller," he says. Williams had been behind the stacks of speakers, playing along, setting up a surprise entrance. B realized he could book more shows and make more money as a solo act. He bought the looping station and, billing himself as Simply B for his fun, funky stuff and B & Company for his singer-songwriter side (he calls them "my sad songs"), he recorded and released piles of music—and gigged like crazy. "I probably played 130 shows last year," he says, "and 100 the year before." But he found it hard to get main-stage slots at certain festivals like the Ogden Equinox, where he says they told him, "the main stage is for bands." It was easy to pull together a sextet from his group of friends, including guitarists Rob Drayna and Max Webb, keyboard player Tim Ouburg, drummer Wyatt Richards and percussionist Dan Muir. B announced the new project with a one-line online news item: "A new funk band has emerged called SuperBubble." They've been gigging for months, and start their first recording this March. It's thrilling, B says, to be able to step back and "lock in" with his band and watch them flex their musical muscles. He's missed that interplay. Does he need another project, though? Considering how much he does all by himself, it's not a problem. Besides, he says, "All that's on my schedule is music."